I spent a bunch of time the last couple of days sprucing up a few of my personal projects. 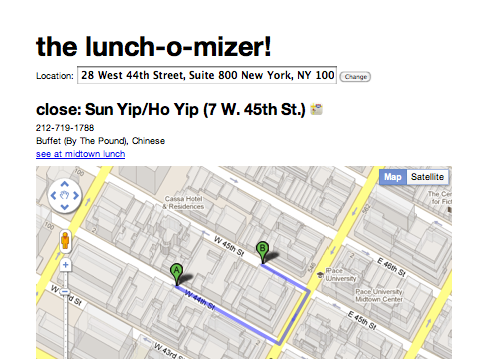 Today was mostly spent on the lunchomizer, which gives you random suggestions for lunch, based on your location. It still only works for Midtown Manhattan since the locations all come from Midtown Lunch and that’s also the neighborhood where I happen to work. Nomadic.mobile?(request.env) ? "mobile" : "default"
And for the curious, the full source is available on github. Fork away!